Cael is addicted to television. 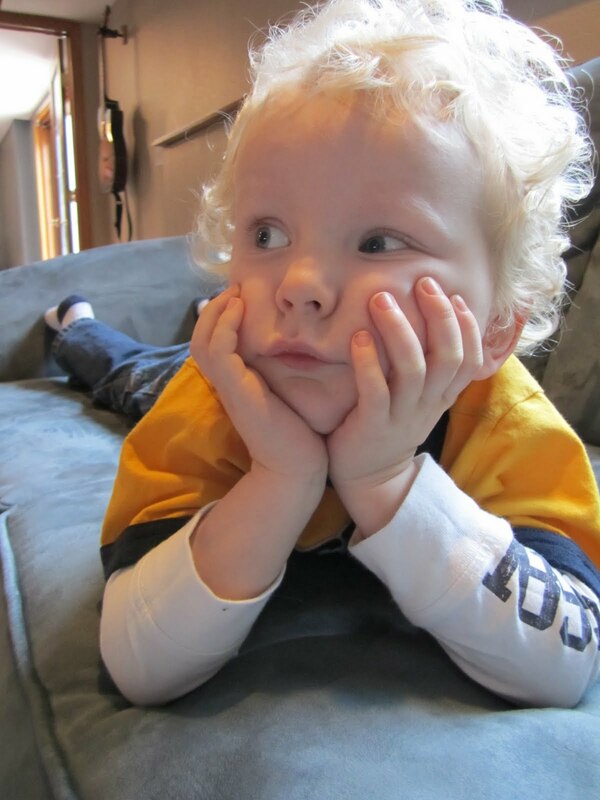 "Pleeeeeease, Mommy, can I watch Mickey Mouse Clubhouse?" "Mommy, I want to see Chuggington!" "Do you have Super Why recorded?" This TV obsession is a constant battle in my house, and one that I fear I'm not fighting as fervently as I should. He watches a Curious George each morning as we get ready for the day, and when he wakes up from his nap which is often more than an hour shorter than the other kids, he will watch a show or two, or part of a movie. It's such a fine line to walk-- I try to let him watch some so that he gets his fill, but I try not to let him watch too much, since I really don't want him to turn into a lumpy couch potato. He'll get that genetically. We don't need to encourage it along. But the days that I attempt to remove it from our lives completely, the withdrawal sets in. The fit that ensues is likely more intense than any addict in detox. He's writhing on the floor; scratching at his arms and speaking in tongues. He lashes out in a voice two octaves lower than his own and I think I may have seen steam shoot out from his nostrils a time or two. I can't blame him, either, because it's my fault. I allowed my son to get hooked on his very first show-- a gateway drug of sorts, called Caillou. Brrrrr... even the sound of his name sends shivers down my spine. If you have a toddler, you likely know of this demon. 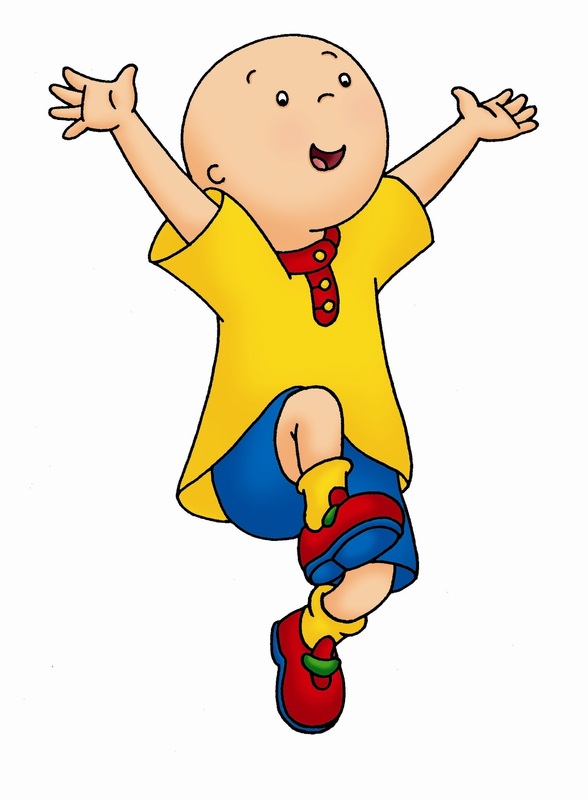 Caillou is a 4 year-old that is constantly throwing fits and being coddled by his wimpy parents. At first, the show isn't so bad-- as one of very few shows with a young boy as the lead character with (more or less) real-world scenarios, it's refreshing and I must admit that Cael learned quite a bit from watching. It also captured his attention in a way nothing else could, allowing me to use the bathroom or change out the laundry. (You know, have some "me" time, right?) The theme song would come on and Cael would run to the television, salivating like one of Pavlov's dogs. But after 6 months or so, there came a shift. His innocent adoration of the little boy was lost. When the show was over, rather than the "Aww, it's done!" that he once would have uttered, I heard "Nooo! Put another Caillou on NOW!" That whiny little bald-headed weasel tainted my son. This had nothing to do with me, and it had nothing, I repeat NOTHING to do with him turning two. Right? Right??? It was that horrible Caillou, encouraging my son to argue and disobey like a tiny "bad fairy" on his shoulder with an unusually piercing voice. There was only one thing to be done. Cut him out of our lives cold-turkey; withdrawals and all. My first attempt at this was unsuccessful, as even toddlers in today's society are as savvy with electronics as the masterminds that dream them up. At two, he was able to locate the remote, put it back into satellite mode (from whatever setting I'd changed it to in an effort to throw him off course) and tune in to PBS at 11:00 each day to get his fix. His pupils would dilate and his body would go limp in satisfaction. Strike one. My strategy for attempt number two was distraction. "You want to see Caillou, Cael? But what about Toy Story? Or what about playing with your trucks? Or we could read a book!" I think he heard me speaking, but the twitching and head-banging of his jonesing prevented him from comprehending my words. Strike two. My last attempt used the only truly effective strategy. If you find yourself in a similar scenario, I suggest you employ it as well. LIE. Lie through your teeth. I'm not suggesting you make it a habit, but a Mommy does what a Mommy needs to do to make things happen. "Cael, I saw a commercial yesterday that said Caillou isn't on television anymore. What a bummer!" Just like a child emerging from a demonic possession, he blinked a few times, looked around and emerged from his addiction. Free at last! And although he has been "clean" for almost 2 years now, I do worry about what will happen when his reading skills reveal my betrayal. Hopefully by that time he won't be so interested in watching Caillou. I will have to hang garlic and wooden crosses around the house in an effort to save my sweet Graham. I can't keep them away from the television completely-- not when they see me watch the Today show in the morning, or tune into Ellen from time to time. My one hope is that even when the tube is on, they can "just say no". Or they can just say "let's dance". I have been known to tell my daughter that "[insert TV character here] had to go take a nap so you can't watch them right now." Good call! Cael knows that Mommy can't listen to "Dinosaur Train" because it gives me a headache... (or because I just can't stand it.) He doesn't even want to see it, he just likes that there is a train! Love it! We too have some TV addiction here. At times I really appreciate it like when I am cooking dinner or trying to get dressed. Let me recommend the movie "Everyone's Hero" if you have not seen it yet. Great for boys. Last project by Christopher and Dana Revees. Thanks Maggie! Yeah, it was a stretch to fit that Ellen clip in there, but since it was tv-related, I figured it was okay. Gotta end on a good note! Natasha- I, too, have learned the beauty of Netflix. We have a DVR, so I already had lots of shows recorded, but not many movies. And sometimes it's a movie day. Three cheers for Shrek, Woody and Nemo!